ON Semiconductor has announced the latest set of USB-C (Type-C) devices that are fully compliant with the latest revision 1.3 specification, enabling easy integration into USB-C systems. The new devices include two controllers and a switch, all of which are aimed at applications such as smartphone, tablets, and laptops, as well as industrial and automotive use cases. 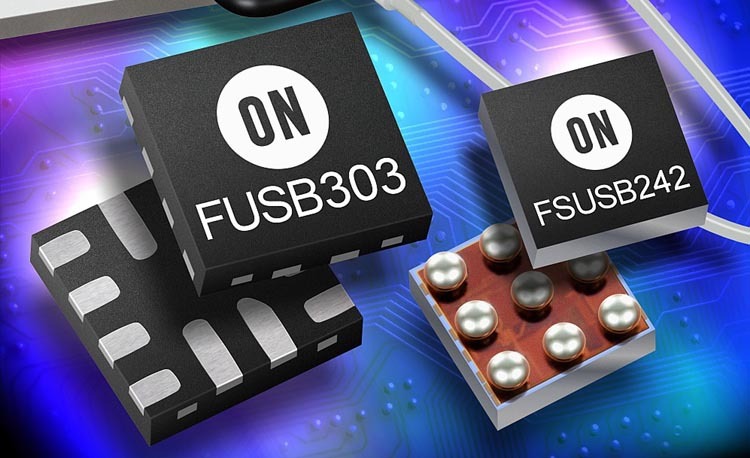 The FUSB303 port controller can convert existing and new systems to USB-C interface, supporting applications requiring Source (SRC), Sink (SNK), or Dual Role Port (DRP) modes. The new device provides autonomous detection and requires minimal processor interaction and firmware support, providing flexibility and offering customization options. Mobile and ultra-portable applications will benefit from the excellent and class-leading low power performance of the FUSB303. In standby mode, the device consumes less than 10 μA. The controller is housed in an ultra-thin (1.6 × 1.6 × 0.375mm) QFN-12 package that is thinner than standard CSP packaging, allowing use in increasingly space-constrained designs. ON Semiconductor's FSUSB242 is a USB-C compliant Port Protection Switch that provides high voltage and surge protection. As required by the standard, the port protection switch allows for multiplexing of two USB sources onto the common DP/DM pins, while maintaining signal integrity. The device includes HV protection and offers IEC 64000-4-5 compliant surge protection up to ±20 volts, without the use of an external transient voltage suppressor (TVS). The FSUSB242 is suitable for mobile applications, as it provides low power consumption, and saves board space with its WLCSP-9 package and elimination of the requirement for an external TVS. 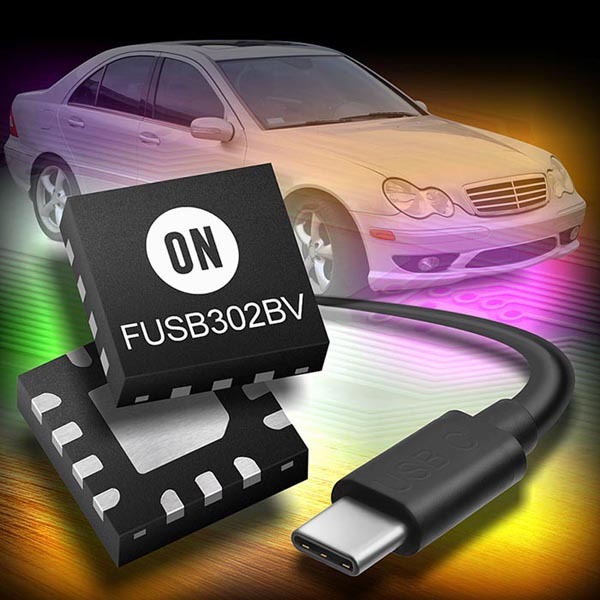 The FUSB302BV is a USB-C controller designed specifically for power delivery (PD) solutions in automotive systems. While other solutions are only available for consumer applications, this device is AEC-Q100 qualified and enables detection, including attach and orientation, making it one of the most efficient and flexible products available. Unlike other solutions, the FUSB302BV communicates via an I2C interface and does not integrate a microprocessor. This ensures the device meets the automotive requirements for minimal energy consumption and low levels of self-heating.